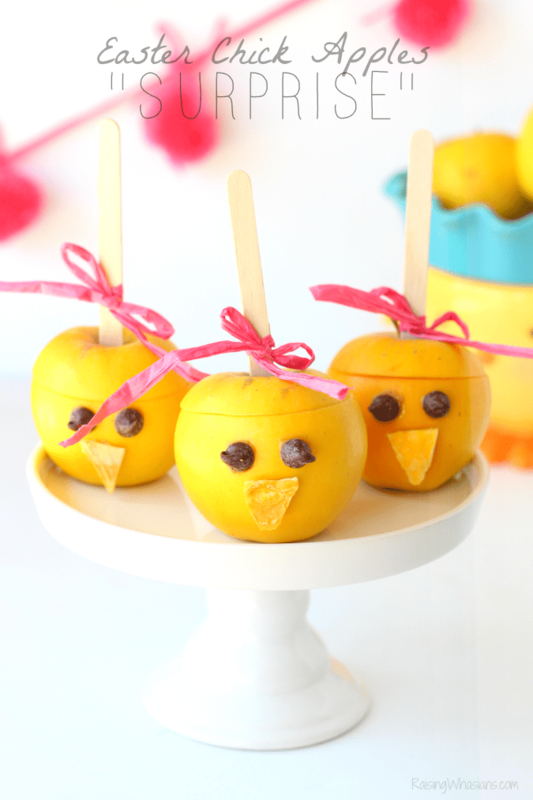 Need a last minute trick-or-treat idea that kids and adults love? 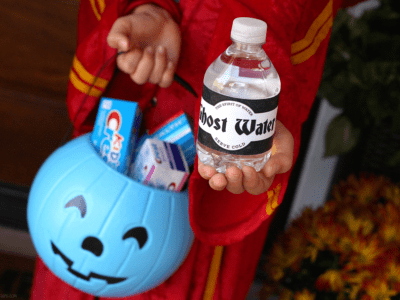 Grab this FREE Halloween Water Bottle Labels Printable ! This post is sponsored by Crest. All spooky opinions are my own. 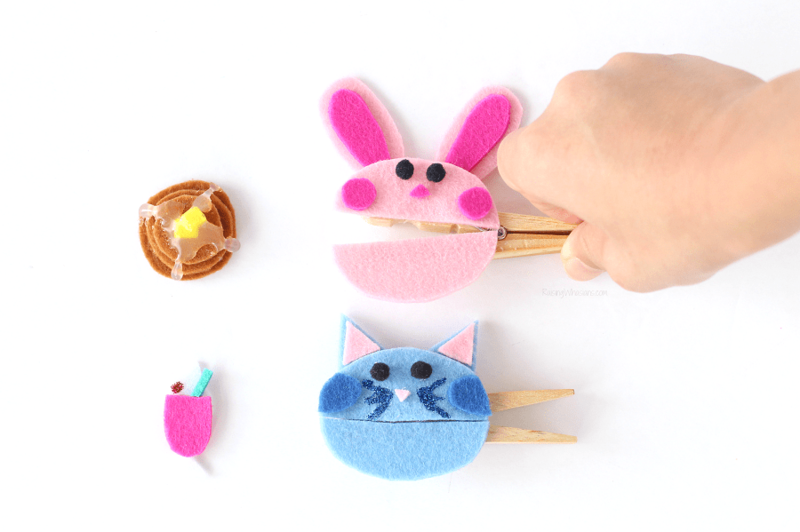 Busy parents who have yet to buy the Halloween candy – I see you. Now before you panic, I have a solution that will make you the most popular house on the block this holiday. And no, you won’t have to sugar rush yourself to the store for the 10th time this week. 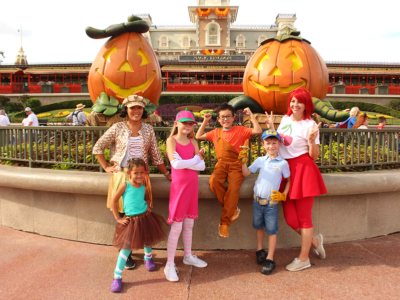 What’s my secret to being the most popular trick-or-treat house in the neighborhood? 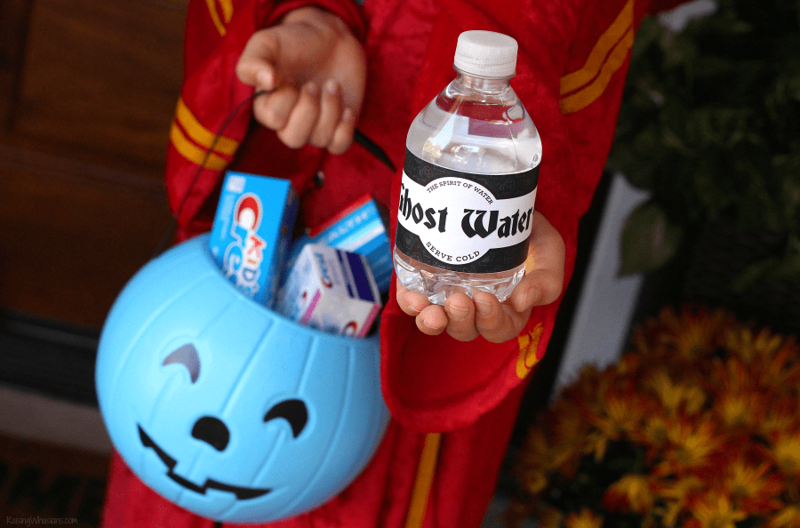 Yup, this FREE Halloween Water Bottle Labels Printable. Now before you roll your eyes and call me LAME – hear me out. 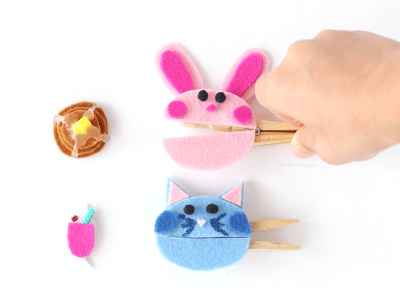 Need a fun STEM kids activity idea? Make Easy Straw Rockets with FREE Printable to celebrate the new Sanity & Tallulah graphic novel series! This post is sponsored by Disney Book Group. All out-of-this-world opinions are my own. May contain commissioned links. Who wanted to live in outer space when they were a kid? I think we all have dreams of what outer space would be like. Lately, this has been a thing with my 10-year old son…space, science and anything graphic novel related. So when you combine his love of STEM and comic books – you get one awesome new Disney Book Group series that’s literally out-of-this-world. 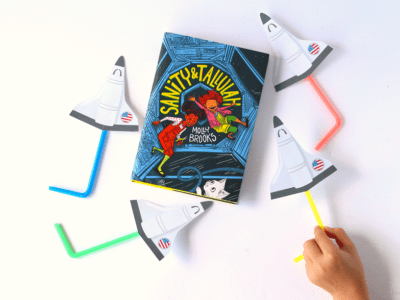 If you need a fun STEM kids activity idea, make these Easy Straw Rockets with FREE Printable and check out why we love the new Sanity & Tallulah graphic novel series for my science-loving reader. Is your child NOT a good sleeper too? 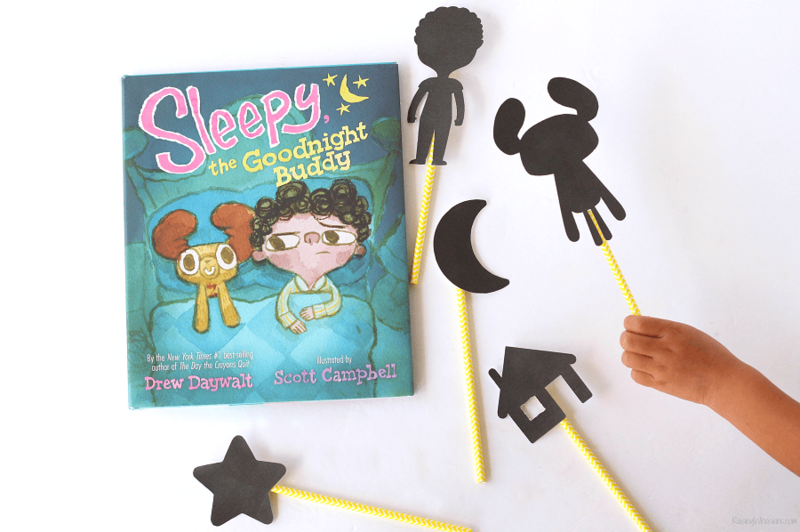 Grab your FREE Shadow Puppets Printable for Bedtime Play and the new book, Sleepy, the Goodnight Buddy. This post is sponsored by Disney Book Group. All child-wrangling bedtime opinions are my own. May contain commissioned links. We’ve always been blessed with a son who never gave us a problem at bedtime. The perfect sleeper, he spoiled us rotten with early bedtimes and no arguments. So when we found out that we were pregnant with our second child, I knew our daughter was going to be the WORST sleeper ever. And as expected, she’s lived up to her non-sleepy personality. 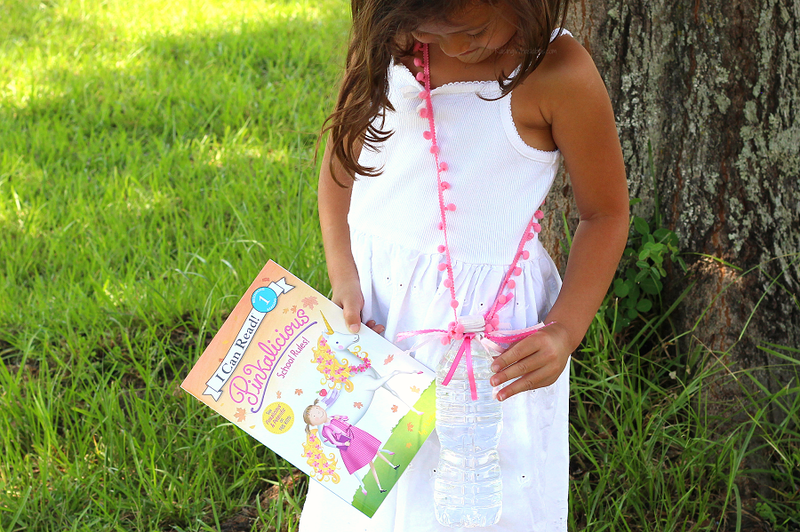 We are preparing for kindergarten with this No Sew Water Bottle Holder for Back-to-School. 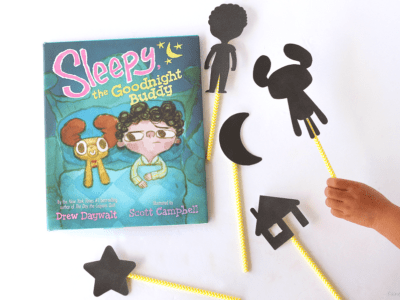 This post is sponsored by HarperCollins and the I Can Read! Early Reader Series. All kindergarten-ready opinions are my own. 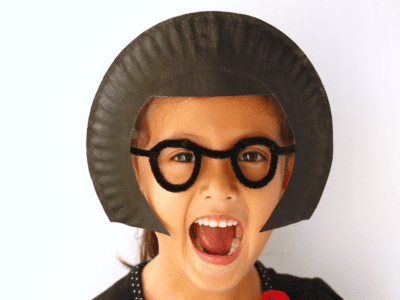 250 sight words memorized by the end of kindergarten – no pressure. I’ve got one little girl entering the “BIG school” this year and we are doing everything we can this summer to make her kindergarten year the best school year ever. Reading is not only a priority, it’s a necessity for my daughter’s love of learning for all of her school years to come. 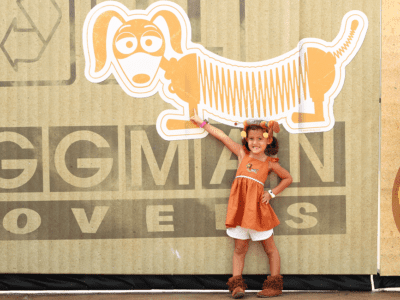 Find out how we’re using the I Can Read! 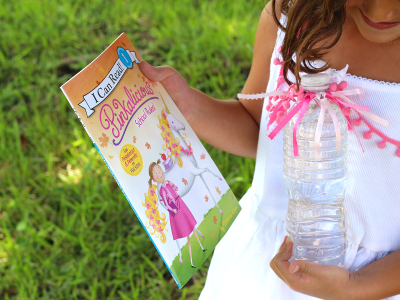 Early Reader Series to help prepare for kindergarten, plus make your own No Sew Water Bottle Holder for Back-to-School (inspired by Pinkalicious), and be sure to scroll down for a fun giveaway! Getting Ready for Kindergarten with I Can Read! 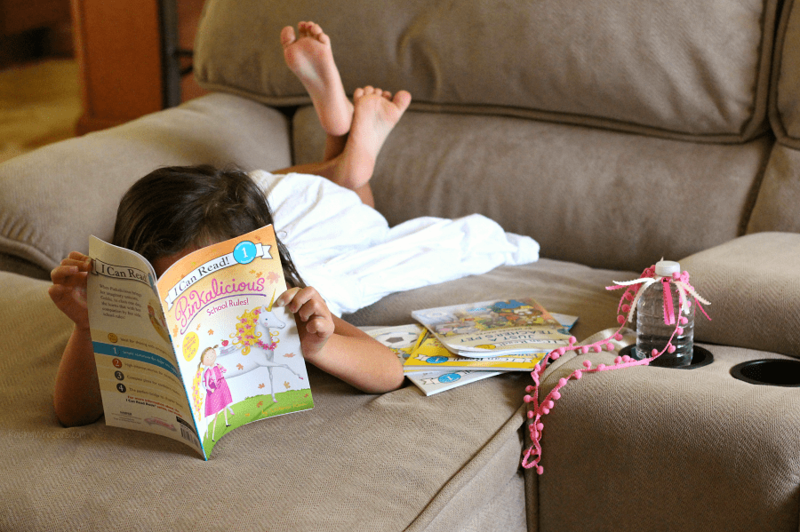 I admit that getting a 5-year old excited about reading is not always an easy task. Unlike her brother (who can read a chapter book with no prompting), it takes a bit more coaxing to get my daughter to read without a groan. But with kindergarten on the horizon, reading is our #1 priority. And when flash cards and reading logs don’t work, I call in the reinforcements. I Can Read! Early Reader Series is a fun and easy way to get my kindergartner excited about learning to read. The easy I Can Read! color coded levels help parents and kids find the books that fit their learning needs. The “My First: Shared Reading” and “Level 1: Beginning Reading” levels are perfect for my upcoming kindergartner. 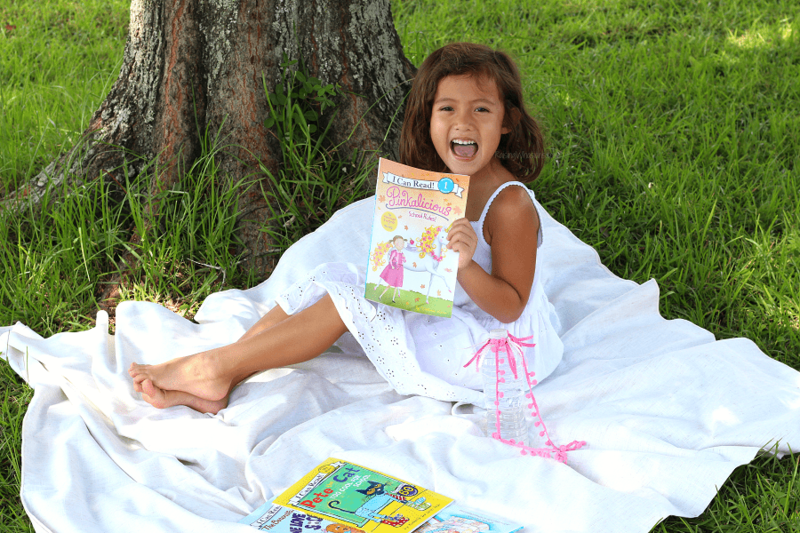 With characters she knows and loves like Pinkalicious, Fancy Nancy, The Berenstain Bears and more, lots of colorful illustrations, stories geared for little learners and simple sentences for success, my daughter is slowly but surely gaining the confidence to sound out words, read on her own and most importantly get excited about the big school year ahead. This girly girl can’t get enough of Pinkalicious. 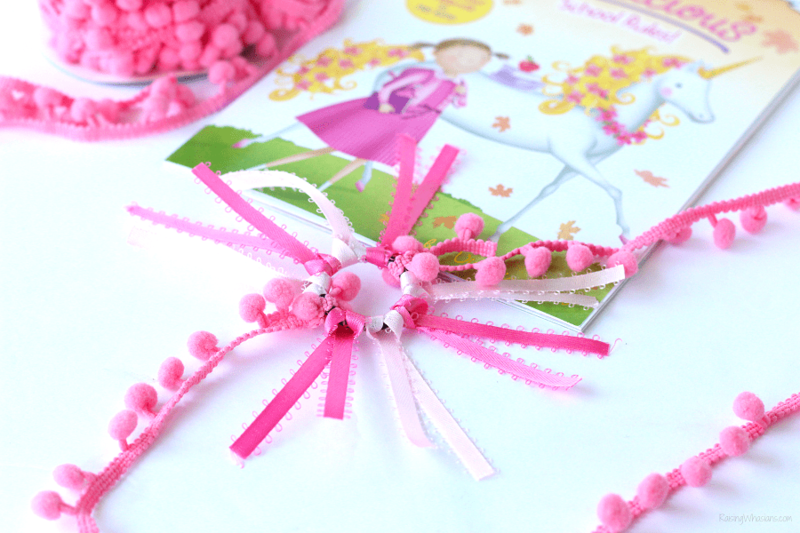 Pink + unicorns + excitement for school = one happy little girl. We’ve been reading this book over and over to get ready for kindergarten. 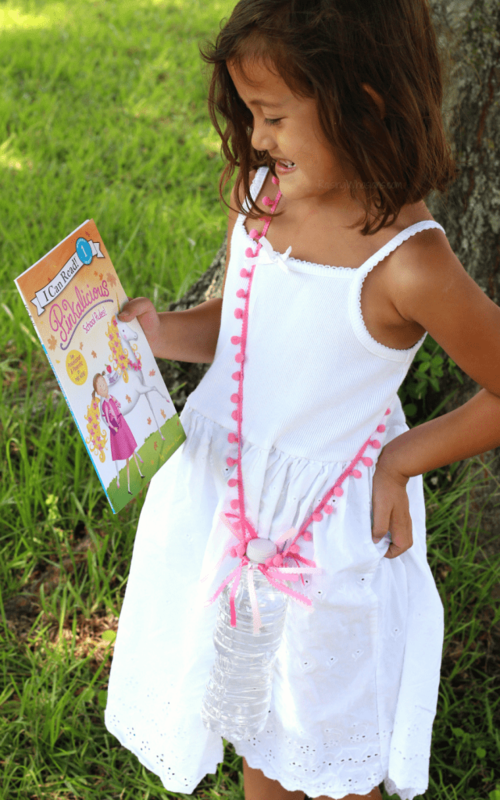 No Sew Water Bottle Holder, inspired by Pinkalicious! 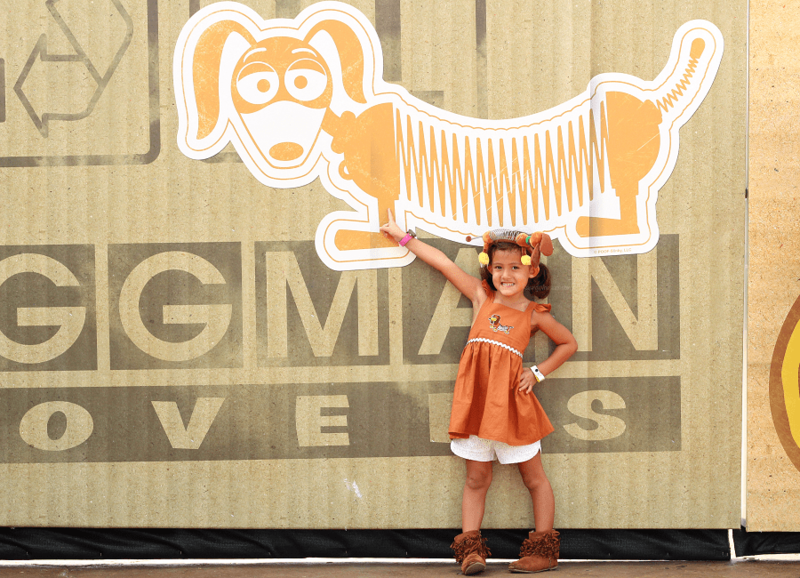 Cut your sturdy ribbon to fit your child (either cross body or strap). 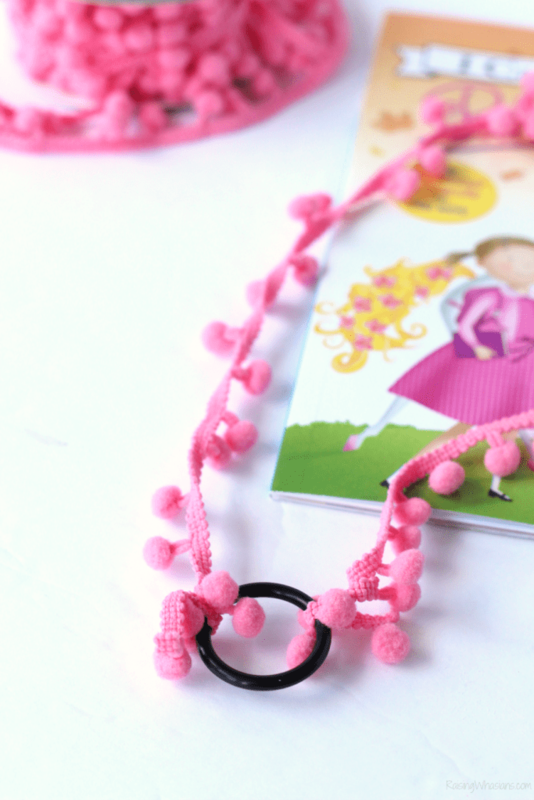 Tie each end of the sturdy ribbon strap around the O-Ring and secure with a knot. Hot glue the knot in place. Allow to dry. Loop in your 1/4-inch thick ribbon strips around the O-Ring as shown. Alternate colors if desired. 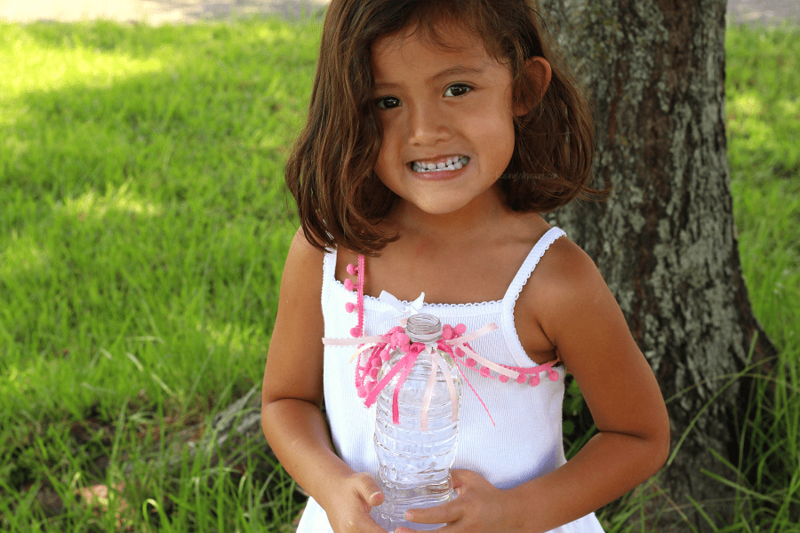 Place the neck of your water bottle into the middle of the O-ring. 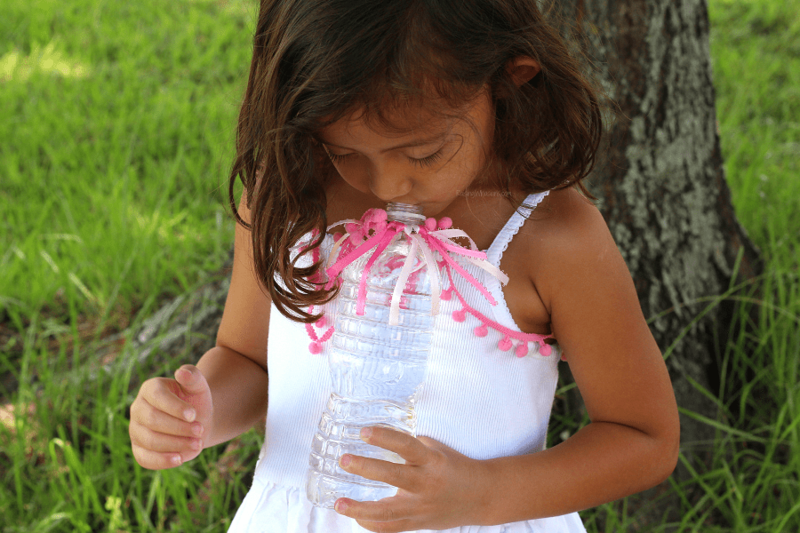 and drink from their own no sew water bottle holder! 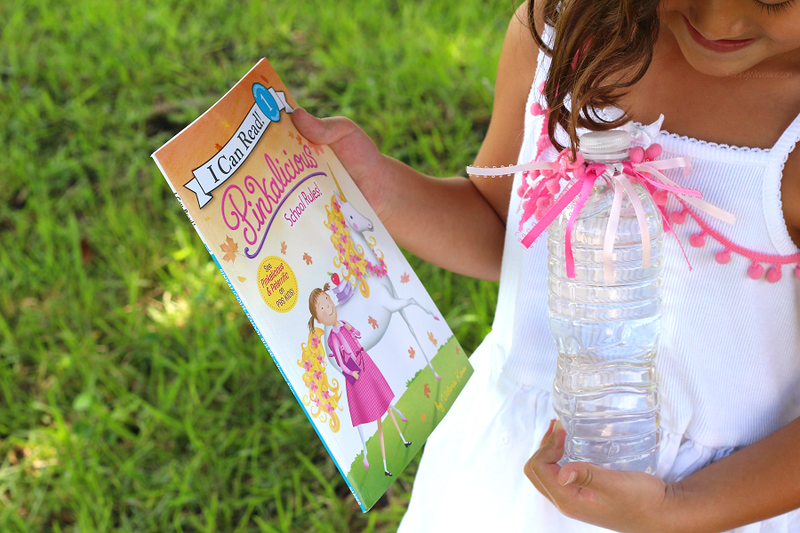 Perfect for carrying around with her this kindergarten school year or on-the-go for our many after-school adventures, I love how this no sew water bottle holder expresses her love of pink and encourages her to read more Pinkalicious books! 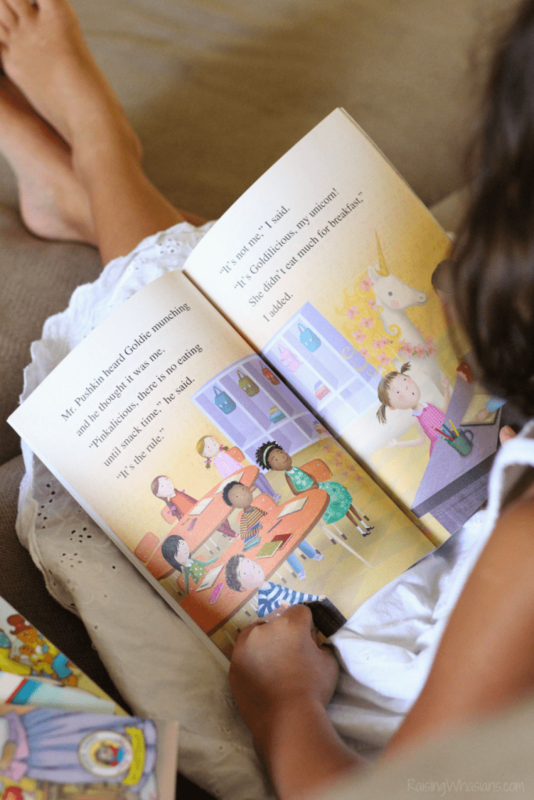 Help get your little learner ready for the school year with I Can Read! Early Reader Series books. Check out all of the amazing kid-friendly titles at ICanRead.com. Super excited for Disney Pixar’s Incredibles 2? 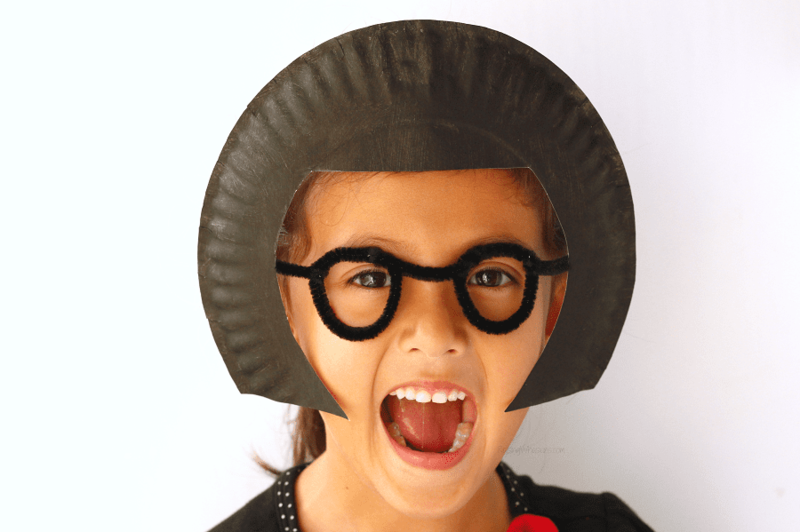 Make this Easy Incredibles 2 Craft for Kids for a fun play date idea! This post is sponsored by Juicy Juice. All crafty opinions are my own. Do you have your super suit? 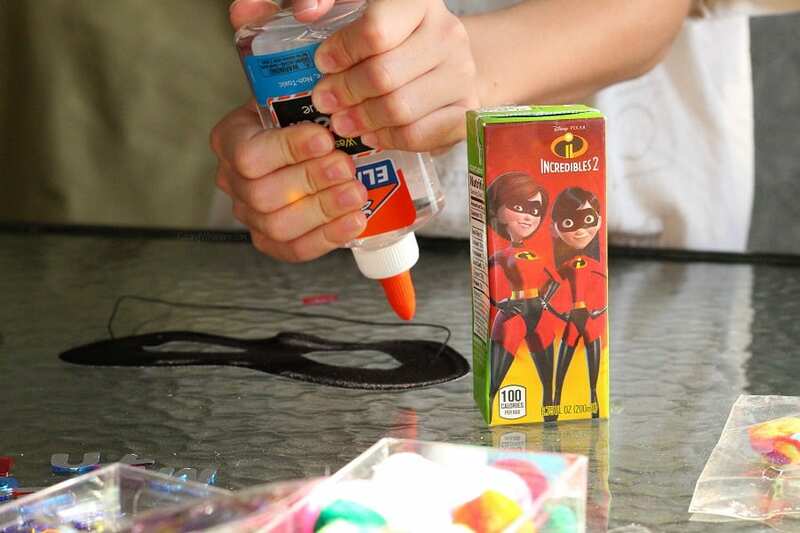 Time to suit up for Incredibles 2 in theaters with limited-edition Incredibles 2 Juicy Juice and this fun and Easy Incredibles 2 Craft for Kids! 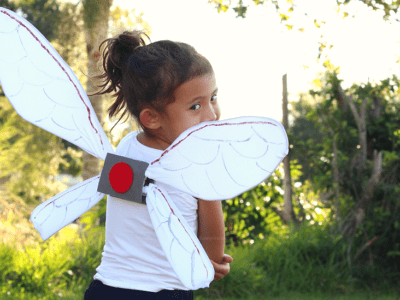 Great idea for a play date or a summer craft, your kids will love bringing out their very own super powers for the most anticipated animated film of the summer! And that’s not all! 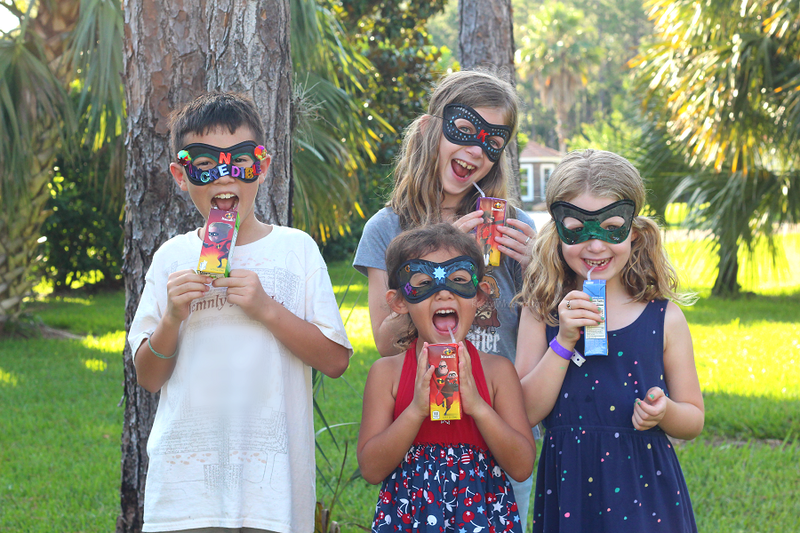 Get ready for an INCREDIBLE summer with new limited-edition Incredibles 2 Juicy Juice, enter the $10,00 Incredibles Family Adventure Sweepstakes, and of course, scroll down for a fun Juicy Juice giveaway! Limited-Edition “Incredibles 2” Juicy Juice + SWEEPSTAKES! Ready to suit up for the biggest animated movie of the summer? Incredibles 2 is in theaters now and your family can experience all of the fun with this FREE Incredibles 2 Ticket Offer and Sweepstakes from Juicy Juice! On shelves May 1, Juicy Juice Disney•Pixar’s “Incredibles 2” 100% juice will be available in 8-pack juice boxes in Apple, Berry, Fruit Punch and Grape, and multi-serve bottles in Apple, Berry, Fruit Punch, Cherry, Kiwi Strawberry and Orange Tangerine. Are your kids incredibly excited for Incredibles 2 in theaters? 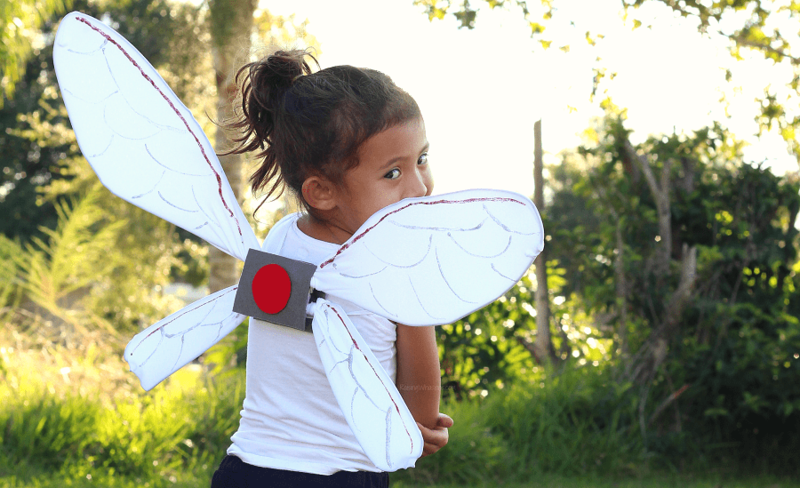 To celebrate our favorite Disney super heroes returning to the big screen, we made this Easy Incredibles 2 Craft for Kids. 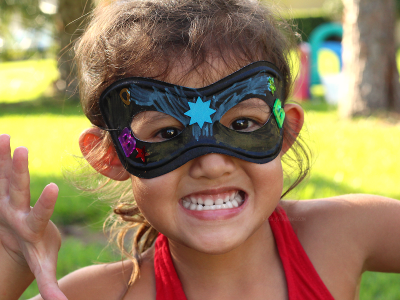 Easy, fun and full of creativity, your kids will love making and wearing their Incredibles 2 mask as they watch the film! Ready to get started? Your child’s favorite craft supplies like letters, glow-in-the-dark pens, glitter glue, paint and more! 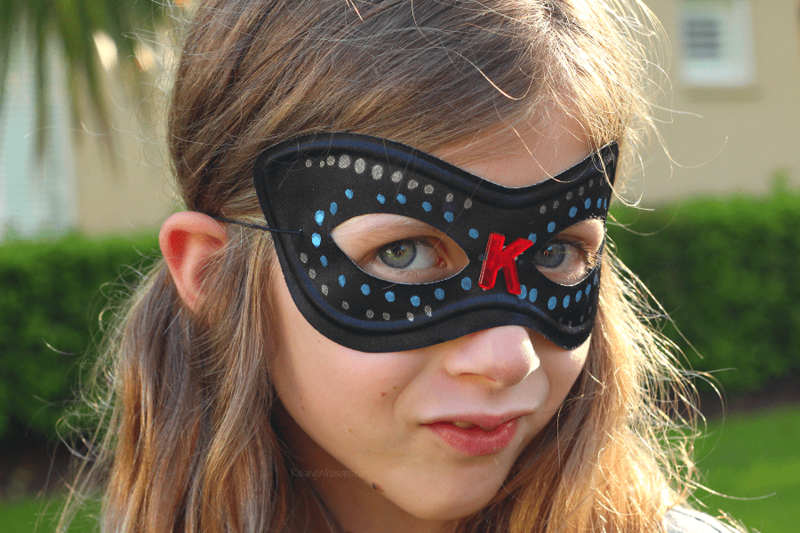 Have your child decorate their super hero mask to match their amazing super hero personality! 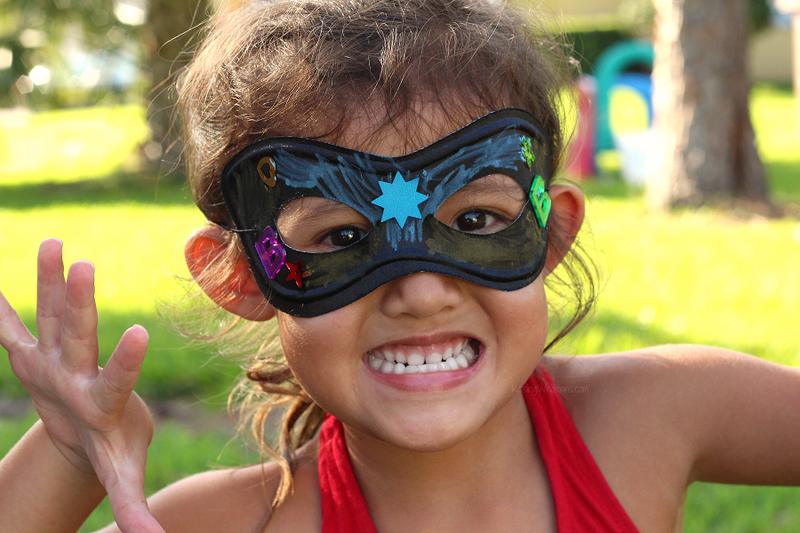 Wear your Incredibles 2 mask craft as they enjoy limited-edition “Incredibles 2” Juicy Juice! 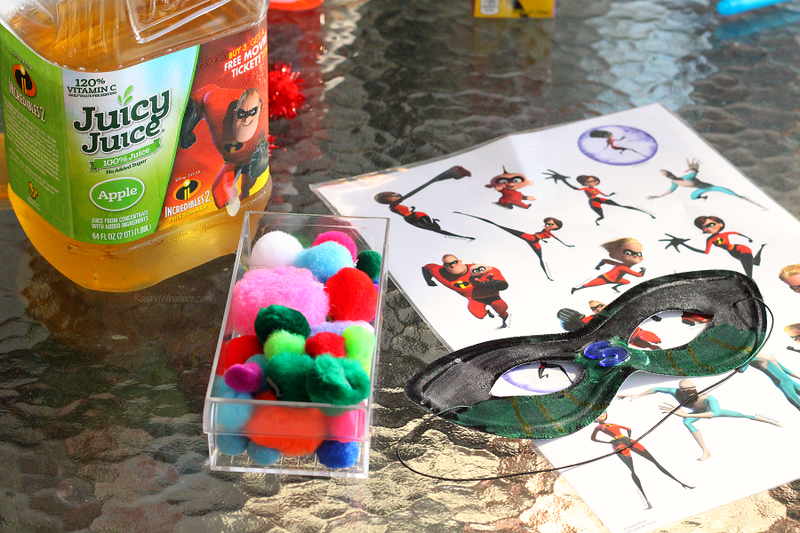 We had the best play date as we made this easy Incredibles 2 craft for kids and enjoyed our favorite limited-edition Incredibles 2 Juicy Juice too! Talk about an incredible day! 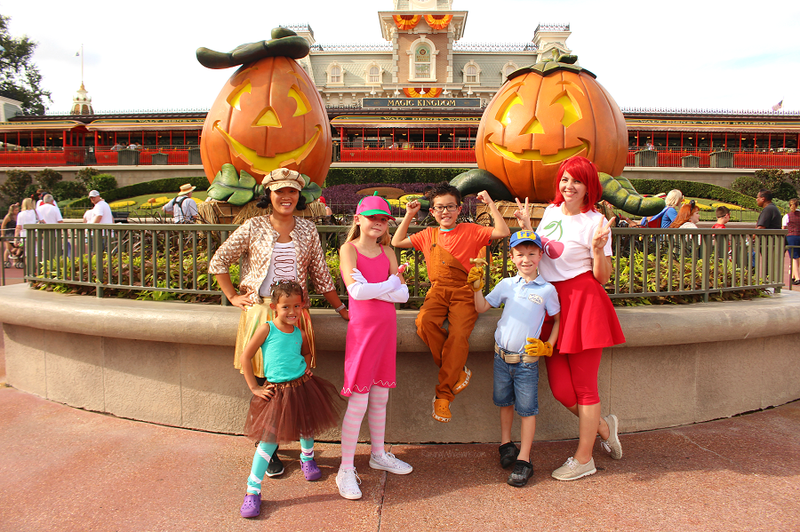 Bonus – the masks make the perfect accessories as you watch the film! Get ready for Incredibles 2 in theaters now with Juicy Juice and limited-edition Incredibles 2 juice bottles and juice boxes. Be sure to follow Juicy Juice via Facebook, Twitter, Instagram and Pinterest for the latest juice products, offers and more.